KUALA LUMPUR: Investors should consider buying into real estate investment trusts (REITs) as the valuations are now very attractive. Prof Datuk Mani Usilappan, former director general of the valuation and property services department at the Finance Ministry, said REIT yields had increased tremendously and most of the REITs were selling at a discount to their net asset value (NAV). “The return or dividend is the same in absolute term but because the share price has been declining, investment return is higher. In addition, investors may enjoy capital appreciation in the future,” he said in his speech during the summit yesterday. Organised by the Association of Valuers and Property Consultants In Private Practice Malaysia (PEPS), the one-day event gathered prominent valuers and real estate players to discuss the current issues and the outlook for the property market in Malaysia. Mani advised investors to look for REITs with a management team that was flexible in its decision making amid the volatile economic conditions. Other criteria to consider are location and rental revision structure of the REITs’ properties. Mani also pointed out the characteristics of a REIT’s stock movement. “During a market downturn, the REIT’s share price will decline in some correlation with the KL Composite Index. “However, in bullish market conditions, the REIT behaves like a bond, where the share price does not escalate,” he said. According to his risk and return analysis, a REIT’s average monthly total return does not discriminate the sector of assets the REIT is invested in. REITs invest in different types of real estate classes such as office, retail, commercial, industrial, healthcare, retail and plantation. Going forward, Mani predicted rental income to continue at current levels, as a “rental crash” was unlikely. He foresaw fewer new assets being injected into the REIT market this year because of yield disparity. Until the economy recovered, he said major players such as Sunway Group, CapitaLand Ltd group, TA Enterprise Bhd and Country Heights Holdings Bhd would defer their listing plans. As at December 2008, REIT yields ranged from 5.63% to 13.77%, which were much higher than the average yield of 6% before the economic slowdown. The share prices were also selling up to 39.3% discount to NAV. KAJANG: Gamuda Bhd’s property arm Gamuda Land Sdn Bhd will continue with its projects despite the softening market. Managing director Chow Chee Wah said there were enough funds to complete its projects, some of which would be on a long-term basis. Chow Chee Wah explaining the development of Jade Hills. “Based on our experience during the last financial crisis, it is better to finish the projects soon so that when the market is stable, the products are ready for the buyers,” he said. He said, for example, when the property sector was badly hit during the financial crisis in 1997, Gamuda continued to develop its Kota Kemuning integrated township in Shah Alam. Two years later, when the economy recovered, sales increased as the products were already there. “When the economy is bad, we can’t just stop the development and wait for the recovery. By then, it may be too late to do sales as buyers want a ready product,” Chow said. 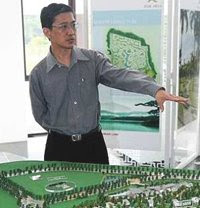 The Kota Kemuning township will be fully developed in three years. Gamuda Land is also the developer of Bandar Botanic in Klang, Valencia in Sungai Buloh, Jade Hills in Kajang and Horizon Hills in Nusajaya. It is also developing a condominum project in Jalan Madge, Kuala Lumpur, which is scheduled for completion in three years. Gamuda Land contributes about 30% to group revenue. On the results of its first quarter ended Oct 31, Chow said the reduced revenue from the property division was due to the economic slowdown which made buyers more cautious. “They prefer to wait and see because of the current uncertainty. However, with the Government initiatives and banks now offering attractive housing loans, we hope buyers will regain their confidence,” he said. He added that based on the cycle of the property market, a recovery could be seen next year. On Jade Hills, Chow said Gamuda Land would transform the 366 acres into a fully integrated township by 2018. “About 260 acres are reserved for residential development, including terrace and semi-detached houses and bungalows. “In total, only 800 houses will be built at Jade Hills, making it a low-density development,” he said. Located in the fast-growing southern Klang Valley corridor and just 20km from Kuala Lumpur, the project is accessible via major highways. “The gross development value of this township is RM1.5bil and we will develop it in phases,” Chow said, adding that there would be a total of 12 phases. Prices of the houses will range from RM700,000 to RM2.4mil. There will be proper road and traffic systems, amenities for a healthy lifestyle and also commercial facilities. “Our target buyers are people living around the Cheras, Serdang and Kajang areas who want to upgrade their lifestyle. We are also targeting expatriates,” he said. When the first phase was launched last month, the company brought in sales worth RM50mil. “The first phase of Jade Hills will be ready by mid-2010,” Chow said. KUALA LUMPUR: Property prices and demand will weaken by 5% to 10% in 2009 due to slower economic growth and a decline in foreign investment, says an industry official. Association of Valuers and Property Consultants In Private Practice Malaysia (PEPS) president James Wong ruled out a property price plunge but said he expected a “gradual correction” as prices had peaked in the third quarter of last year. “At this point, there is no panic and force selling. Our property market is more mature and there is less speculation,” he said. Real estate investment trusts cutting back on property acquisitions, which had been a significant factor in the rising property market for the past two years, was partly blamed for the slowing property demand, he told a press conference yesterday. Wong forecast property launches to soften this year and said he expected a prolonged economic slowdown. To boost the property market, development and consumption had to increase, which he said were unlikely to happen this year as many potential buyers would opt to save. “Many potential buyers and investors are adopting a wait and see strategy (and thus are not spending). “How resilient our economy is in 2009 will depend on domestic demand and the recovery of the Asian giants, including China,” he said. He added that the RM7bil stimulus package was too small to have a meaningful impact, as it only represented 1.4% of the national gross domestic product (GDP). He stressed that Malaysia needed a second stimulus package to prevent the economy from falling into recession. “Government should reduce personal income taxes and increase disposable income to directly increase domestic demand and consumption. “It should also improve the investment climate such as liberalising the Foreign Investment Committee (FIC) guidelines on foreign purchase of real estate, licensing, visa and work permit requirements and relaxing the foreign equity participation policy,” he said. If possible, he hoped the Government would emulate the approval process adopted by Singapore and Hong Kong for manufacturing projects. Wong also recommended further interest rates cut by Bank Negara to help revitalise the economy. KUALA LUMPUR: Developers of hypermarkets should consider the needs of shoppers if they want to keep pulling in the crowds. Regroup Associates managing director Allan Soo said with the weaker market sentiment currently, hypermarkets needed to be more than just “faceless big boxes”. “There are too many poor quality malls around. Many of them are not well planned or family-orientated. Developers need to change the architecture and not just build a shoe box,” he said in his presentation at the property summit yesterday. He said many malls were monotonous and had the same problems, such as insufficient parking space, which often deterred people from shopping. “Shoppers also should be more vocal about what they want,” he said, adding that hypermarket developers needed to consider issues such as size, location and accessibility. On another note, Regroup Associates executive chairman Christopher Boyd said hypermarkets should have a different mix of brands to attract a wider audience. “Every mall has the same brands. This creates mall and brand fatigue. There should be a better mix of new brands, products and merchandise,” he said, adding that there were too few local brands in hypermarkets. “There aren’t enough Malaysian brands in a conventional mall. All it takes is a sense of adventure and a little bit of skill. “Alternatively, they can always outsource if they lack the skill.” Soo said. PETALING JAYA: Property developer Tan Sri Mustapha Kamal Abu Bakar’s company Ketara Megah Development Sdn Bhd has acquired 23 acres of land in Selangor from MK Land Holding Bhd for RM150mil. Ketara Megah had acquired the two parcels of leasehold land in Sungai Buloh in an open tender exercise from MK Land, of which Mustapha Kamal is chairman and chief executive director. MK Land said in a statement on Tuesday the sale consideration of RM150mil was in excess of the forced sale value of RM118.35mil indicated in the valuation by PPC International Sdn Bhd. At the close of the tender exercise on Dec 15 last year, only one tender was received, which was Ketara Megah. The land was originally acquired by MK Land’s unit Saujana Triangle Sdn Bhd in 1995 for RM3.72mil. As at June 30 last year, the book value was RM151.9mil due to the fair value adjustments, said MK Land. “The entire proceeds from the proposed sale will be used for working capital,” it said. It added the proposed sale would unlock the value of land which MK Land had no immediate plan to develop. MK Land said the proposed sale was by open tender and the transaction was not regarded as a related party transaction under the Bursa Malaysia Securities’ listing rules.